Here is our happy new retail staff! H and H Feeds are now available at local feed stores in and around Austin, Dallas, Houston, Corpus Christi, and San Antonio plus many towns in between. If your feed store is not carrying the H and H ration that you need please ask for it and we will work to get it to them. 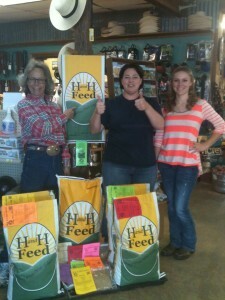 Ask your feed store to carry H and H Feed! We work with small feed stores to make it easy for them to succeed carrying, promoting, and selling H and H Feed. Please ask them to call Roselyn Johnson at 512-878-7283. Let your feed store know that you want them to carry H and H Feed! Oklahoma and Alabama – Distributor opportunities available ! Call 512-878-7283 to inquire!